Krakow Old Town Guesthouse i Krakow, Polen: Bestill nå! 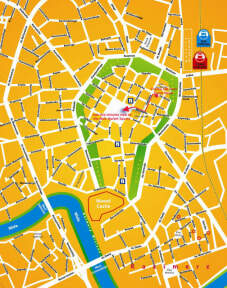 Cracow Old Town Guest House offers accommodation a 3-minute walk away from the Main Market Square. It provides simple rooms with a TV set, a fully equipped kitchenette and private bathroom facilities. Free Wi-Fi is available. In the morning a breakfast buffet is available at another location, 50 metres from the guest house. The guest house provides a ticket service and arranges a shuttle service at an additional surcharge. The Wawel Castle and Kazimierz, the Old Jewish district is 1 km from the Cracow Guest House. Kraków’s main railway station is within 700 metres. Old Town is a great choice for travellers interested in Food, Nightlife and History. Public parking is available at a location nearby (reservation is not possible) and charges may be applicable. Private parking is available at a location nearby (reservation is needed) at a price of 80 PLN per day. Both car parks are located 100 m away.